This sentiment is supported by a wealth of research which demonstrates that displaying gratitude has many positive effects. But what are these benefits and how can a sense of gratitude be developed? Across a set of three fascinating studies, participants of varying ages were asked to write a thank you letter expressing their gratitude to someone they believed had touched their lives in a meaningful way. They then had to predict how happy, surprised and awkward this would make themselves and the recipients feel. The researchers found that writing this letter not only lifted the mood of the recipient but also the mood of those who sent the letter. In a different study, participants had to create a weekly list of either gratitude-inducing experiences, irritating experiences, or life events. Those in the gratitude group felt better about their lives as a whole and were more optimistic in their expectations for the upcoming week. Additionally, they had fewer physical complaints (e.g. stomach-ache, chest pain, stiffness), spent significantly more time exercising, and saw improvements in sleep quality. Further research has shown that writing letters expressing gratitude can also reduce depressive symptoms. Research has shown that grateful people are more likely to help someone with a personal problem or offer emotional support. Additionally, it has been shown that expressing gratitude can strengthen a close relationship, as the recipient feels as though you care for their welfare. It has been suggested that expressing gratitude motivates people to display prosocial behaviour, as this expression increases their feelings of social worth. In one piece of research, participants had either grateful, happy or neutral emotions induced. This was achieved by asking them to think of an event that made them feel grateful or happy, or by encouraging them to think about the events of a typical day respectively. The researchers found that those placed in the gratitude condition showed more patience in comparison to those in the happy or neutral condition. Gratitude not only reduces impatience but also encourages individuals to recognise that being patient may lead to more favourable outcomes in the long term. Another study showed that students who listed gratitude inducing experiences had more positive school experiences. This is a promising finding, as children who are satisfied with their school experience will enjoy school more, find it interesting and believe they are learning a lot. This in turn leads to greater success both academically and socially. 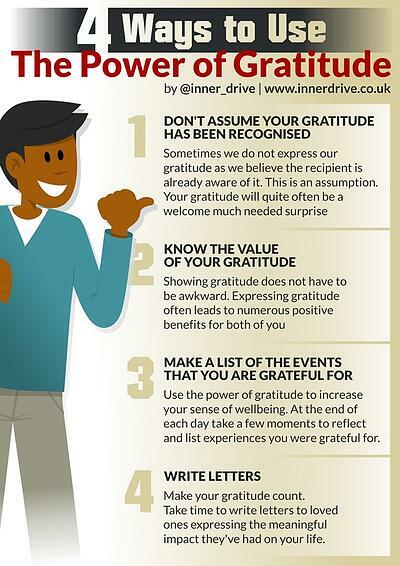 We know a sense of gratitude can have many positive benefits. So how can we help others develop this? Recent research has found that people often do not express gratitude because they assume that the recipient is already aware of it. However, this is often not the case. If individuals are aware that their gratitude is often not recognised, then they will be more likely to express it. Individuals often do not display their gratitude as they believe it may lead to an awkward social interaction. However, people tend to overestimate how awkward recipients of gratitude feel, whilst underestimating its positive effects. Other research also supports the idea that people tend to undervalue positive interactions with others. In one experiment, a group of participants were given money to spend on either themselves or others. The researchers had predicted that the participants would be happier if they spent the money on themselves. However, this proved to not be the case, as their follow-up experiment revealed that the group instructed to spend money on others were significantly happier than a group instructed to spend money on themselves. Research has shown that it is possible to develop gratitude by getting individuals to list experiences to be grateful for at the end of each day. The lists do not have to be complex but can include experiences we usually take for granted, for example having a supportive family. Making a list can also improve mood, life satisfaction and wellbeing. Gratitude can be developed through letter writing. It has been found that writing three letters over an 8 week period that took only 10-15 minutes to compose and were only a page in length was enough to improve gratitude and happiness levels. Once gratitude has been developed, many other positive outcomes follow, such as improvements in wellbeing, stronger relationships, and a reduction in impatience. The development of gratitude can be improved through simple ideas such as letter writing and listing events to be grateful for; hopefully, this in turn will help make our students happier and more successful.